Have you ever heard of dish flowers? 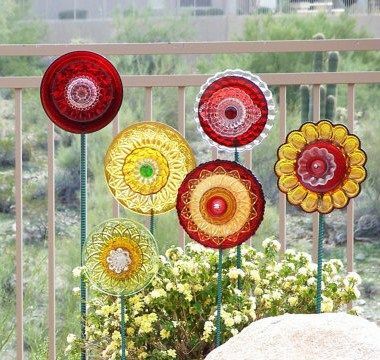 They are becoming more and more popular for people who like to get crafty in the garden and think of unique and creative ways to decorate it. Dish flowers are exactly what you’d think. They are flowers that you make out of dishes. Confused about how that might work? We are here to help you out. Today, we are going to be looking at the process of making your own dish flowers and also provide you with some interesting ideas all the while. Let’s have a look, shall we? Why Are Dish Flowers Great? Well, first of all because they give you the opportunity to make something yourself and actively contribute to how your garden is going to look. Plus, you can recycle old dishes, which is always great for the environment. Not to mention that if you do decide to use old dishes, it will give the entire thing an amazing vintage look. Another reason why you should try decorating your garden with dish flowers is that they will always be there, no matter the season. So when nature is refusing to provide your garden with any color, the dish flowers will definitely take care of that. How to Make Your Own Dish Flowers? Naturally, the first thing you should do is choose the dishes you want to use. They can be of any size and color, and the more patterns they have, the better. We actually suggest you use dishes of multiple sizes and balance them out in the garden. After all, real flowers also come in all sizes and colors. Any flower has to also have a stem attached to it. Now, you can make the stem out of several things that should barely cost you any money, if at all. For instance, you could try copper pipes, rebar rods, wooden dowels, aluminum pipes, curtain rods, branches, or even recycled railings. Now, this is the final step, and perhaps the most complicated one. You have to think how you are going to attach your soon-to-be flowers to their respective stems. The first and safest way to do that is by using an electric drill. 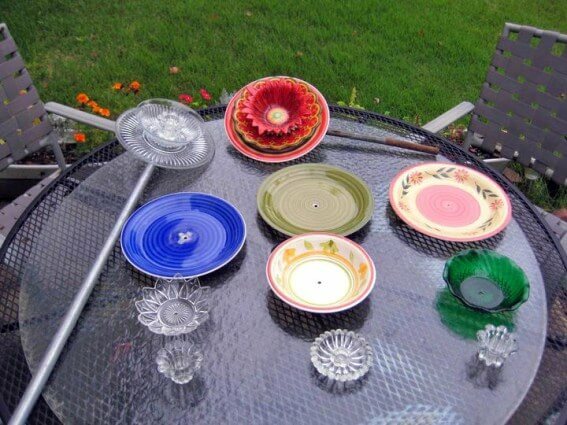 You drill a hole in the dishes using a special bit made specifically for glass. Then you just bolt the two pieces together. This process might take a while and require some patience, but once you are done you can be sure that the installation is secure. The second option would be to attach the dish to the stem using glue. Not just any type of glue, but one that is designed for outdoor use. This is easier to do and it takes less time, but it might also be less secure. However, if you want to try it out, you should know that you have to let the glue dry for about 24 hours. Should You Also Attach Leaves? That is definitely up to you. You can leave the dish flowers as they are and just stick them into the ground, or you can make them look more realistic by attaching real or faux leaves to the stem. 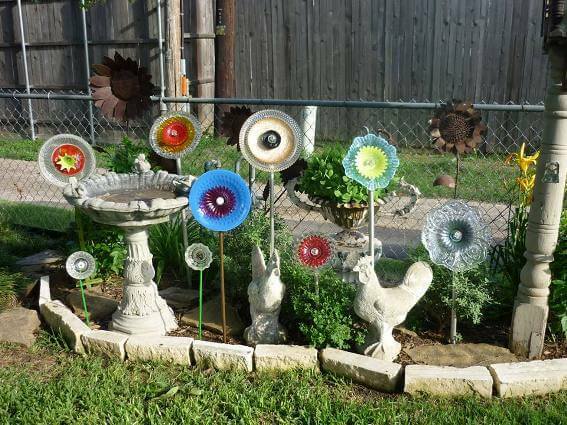 Overall, making your own dish flowers to decorate your garden with is a great way to get busy and spend some time outside, working to make your garden more beautiful and interesting. Give it a try!